Review: The X-Men send Wolverine into the past. This is to make a desperate effort to change a historical event and an epic battle that could save our future. I have looked forward to this film ever since it was announced. It was even better than I anticipated it to be. The only thing I would have liked was to see Ian McKellen and Patrick Stewart a bit more. They weren’t in it enough. The time travelling I thought worked really well. James McAvoy’s performance was outstanding. Even though it was a very long film the time went very quickly. 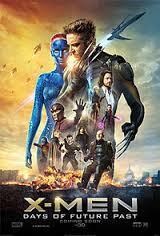 For me this is the best X-Men film. Great to see Bryan Singer back directing. Once Ian McKellen, Patrick Stewart and Hugh Jackman agreed to sign on Bryan Singer then could begin work. Halle Berry’s character had to be reduced as she was pregnant. When Michael Fassbender put on his mask for the first time I did laugh and thought that it was good preparation for him for his next performance in the film Frank. The next X-Men film is out in 2016 and it is called X-Men: Apocalypse.